Samsung launched the Galaxy S9 and the Galaxy S9+ at the end of February. 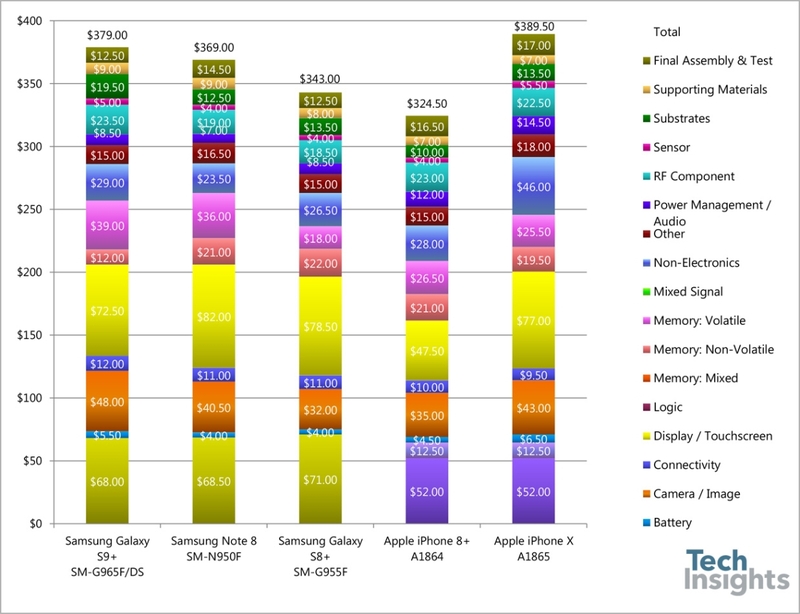 TechInsights analyzed how much different components and manufactiring cost for the Plus version and reached a price of $379, which is $10 more than the Galaxy Note8, making the S9+ the most expensive Samsung smartphone to build so far. The analysis compares the Galaxy S9+ (global version), the Galaxy Note8, the Galaxy S8+, the iPhone 8 Plus and the iPhone X. Of all these phones, only the Apple flagship is more expensive to produce with a total cost of $389.50, just $10 more than the new Samsung device. Looking at prices for different components, the Exynos 9810 chipset contributes $68, while the Super AMOLED panel is estimated to cost $72.50. Other expensive parts are the camera, the memory, and non-electronics, which is mostly the glass sandwich shell of the phone. The $379 price is just the manufacturing cost. This means it doesn't include other expenses like research and development, marketing, distribution and taxes.